Creating a character in D-RP can be more than a little daunting the first time around, with all the new rules and terminology to learn. Like most things (paticularly RP) it becomes 2nd nature in no time, especially when you have all the information here to refer to as you go. All the information for your character is stored on a Character Sheet, and we'll go over that after the basics of Character Creation. You'll be needing that Character Sheet to fill all the information into once you're done but I recommend opening a document writer on your computer to jot things down as you go or even use a good old fashioned pen and paper. Once you've worked out all your character's information then you can copy it into your character sheet. 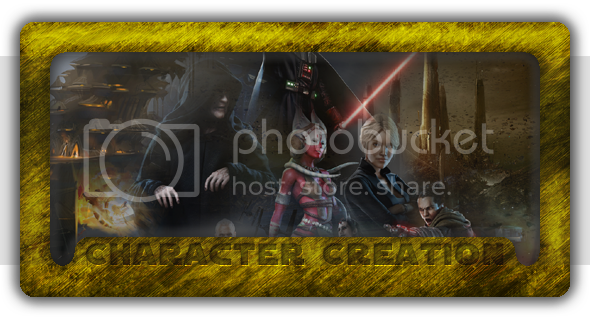 Your character sheet can be accessed by clicking on 'PROFILE' from anywhere on this site and then clicking on 'Character Sheet'. Here's how you create a character for D-RP, step by step. Examples are written in green. For the purposes of this exercise we'll be making an Imperial Agent called 'Syeliss'. Each character has six ability scores which represnt their basic strengths and weakness. These Abilities - Agility (AGL), Awareness (AWA), Dexterity (DEX), Intelligence (INT), Personality (PER) and Physique (PHY) - affect everything a character does, from fighting to using skills. A score of 0 in an ability is the galactic average, and an amount above zero shows an apitude in that area, wheras as score in minus numbers is a weakness. *You get 6 points to spend among these Ability Scores. *At this point you cannot spend more than 3 points on any one Ability Score, and no Ability Score can go below -1. *For each Ability that you drop to -1, you get an additional point to spend on another Ability. A score of 0 means you are average compared to other members of the same species, -1 below average, +1 above average, +2 superior, +3 outstanding. LW starts work on his new character. For now all he's decided is that he wants it to be a 'stealthy' character. All of his Abilities start at 0 and he has 6 points to spend. He spends 2 points on AGI, 1 point on AWA, 1 point on DEX, 1 point on INT and his final 1 point on PHY. Select from one of the 40+ Species found in the ' Dynamic-RP: Species' section. Make a note of your of your chosen species 'Traits'. LW decides his new character is a member of the Bothan species. Select from one of the 9 Classes found in the 'Dynamic-RP: Classes' section. Be aware that some species cannot be certain classes. Make a note of your classes' Starting Traits. LW decides his new Bothan is going to be an Imperial Agent. If your chosen species has "Ability Modifiers" add or subtract these from your character now. NOTE: At this point modifiers may cause Abilities to go over +3 or lower than -1. You already know how many Skills you get from your chosen class (and occasionally, your chosen species), now all you have to do is choose them. Certain skills (such as force-based ones) are only available to certain characters and some skills cannot be used by certain classes (a Smuggler cannot use Heavy Armour skill, for example). To see what all the skills do, please go to the Skills & Feats Section. For his 'Major' Skills: Athletics, Computers, Persuation, Pistols and Thievery. Each of these are at Rank 9. For his 'Average' Skills: Concentration, Galactic Lore, Reflex, Research*, Stealth & Unarmed. Each of these are at Rank 6. For his 'Minor' Skills: Acrobatics, Guile, Armour (Light), Perception, Rifles & Willpower. * Remembering his species Trait of Skill Focus: Research, he Looks up the Feat and it says it adds +3 to the reseach skill. He also remembers to add +2 to his Willpower Skills because that is one of his Bothan Traits. Ah, shopping! Next you need to look at your character and make a note of all the starting equipment you get under "Starting Equipment" from your chosen Class because you get this FREE. Next roll the appropriate dice for starting credits and you also have that to spend on whatever you want from the "Outfitting" section. 3x Implants (Chooses Bio-Stabalizer, Cardio Implant and Sensory Implant. Hit Points (HP): The amount of damage your character can take before falling unconscious. Fortidude Defense ('FORT') allows you to resist damage dealt to you. Your Class Level + Your PHY Ability Score + Armour/Equipment Bonus + Fortitude Skill. Reflex Defense ('REF') allows you to dodge or mimialize damage dealt to you. Willpower Defense ('WILL') allows you resist mind-altering effects such as fear, Force powers, etc. Your Class Level + PER Ability Score + Willpower Skill. If you are a Force User you get an amount of FP per game session. All other Classes begin at level 1 without Force Points. If your storyteller is using the Optional 'Destiny' Rules then you begin at level 1 with one Destiny Point. * Note that for Reflex, the Class Level (1 in this case) was not added, because for Reflex Defense you add EITHER your Armour Reflex Bonus OR your Class Level, not both. The last details you need to add to your character sheet help you visualize and roleplay your character. You need a name, of course - something that fits your class, species and the Star Wars galaxy. You should also determine your characters' age, gender, height, weight, eye colour, hair colour etc. Lastly go through all your abilities, equipment and skills and double-check no other modifiers have been missed and need to be taken into account. The Bothan Imperial Agent becomes 'Syeliss'. She is 36 years old with dark brown hair and hazel-coloured eyes. 2. The Cardio implant also addes +1 HP per level. New total is 28.